Cover: The Staff Ride, painting by Don Stivers, courtesy of the Command and General Staff College. The original was a gift to the college from the centennial class of 1981 and hangs in the main lobby of Bell Hall at Fort Leavenworth. "Prepared for the U.S. Army Center of Military History, Washington, D.C."
1. Staff rides. I. Center of Military History. Staff rides represent a unique and persuasive method of conveying the lesson of the past to the present-day Army leadership for current application. Properly conducted, these exercises bring to life, on the very terrain where historic encounters took place, examples, applicable today as in the past, of leadership tactics and strategy, communications, use of terrain, and, above all, the psychology of men in battle. This historical study, particularly with personal reconnaissance, offers valuable opportunities to develop professional leader ship and the capacity for effective use of combined arms on the air-land battlefield. Take Gettysburg, for example. The resolution, initiative, and courage of Colonel Joshua Lawrence Chamberlain of the 20th Maine reflect valuable principles for study by today's leaders. These leadership principles transcend technological advances and have no historical bounds, no binding parameters of geography and time. After a long hiatus, staff rides have again found their place as an accepted part of professional leadership development, be it at the Army War College the Command and General Staff College, or a battalion in the Seventh Army. We welcome The Staff Ride as an important new Army publication. The wisdom contained within its pages will provide appropriate guidance for thou of us who want to utilize the staff ride to enhance the professionalism of the Army. Our turn-of-the-century staff rides stressed those "elements still important in battle ... leadership and the psychology of men in combat." The participant in a properly conceived and conducted historical staff ride will be rewarded by an enhanced understanding of those key elements and of the essential fact that battles are not systematic, logical undertakings but rather activities o men with all their frailties and strengths. In the summer of 1906, the assistant commandant of the General Service and Staff School, Maj. Eben Swift, and twelve of officer-students at Fort Leavenworth boarded a train for Georgia. So began the first "staff ride" for instructor, and students at what is now the U.S. Army Command and General Staff College For five years the staff rice was an important part of the Leavenworth curriculum. Since then, staff riding as a technique of furthering the military education of professional Army officers has been employed at the Army War College the Staff College, and elsewhere. Different from tactical exercises without troops or from battlefield tours, staff rides combine a rigorous course of historical preparation with an examination of the terrain on which an actual battle occurred This brochure demonstrates how a staff ride can be made available to military leaders throughout the Army, not just those in the formal education system With a certain amount of effort, the modern commander can provide a powerful and enduring impetus to the professional improvement of his subordinates, and along the way he can encourage and enliven his unit's esprit de corps—the con stant objective of all commanders in times of peace. After a long interruption that began in World War II, staff riding slowly began to be rejuvenated in the U.S. Army in the late 1960s and early 1970s Professor Jay Luvaas, now on the staff of the Army War College, performed yeoman's service in developing the staff ride technique on our nation's battlefields. Seventy-three years after staff rides were canceled at Leavenworth, a new version returned to the curriculum at the Command and General Staff College; Lt. Gen. William R. Richardson, commander of the Combined Arms Center, sponsored their reinstitution. These new staff rides were a far cry from the relatively simple affairs three-quarters of a century earlier. Historical knowledge about all battles had advanced significantly. Military history as a specialized field of historical study had emerged since the first staff ride and provided a certain rigor to the exercise that had been lacking in earlier versions. The students of the Staff College were more advanced intellectually than their predecessors, and the faculty had also benefited from the work of their forebears at the War College and elsewhere. The staff ride took its new place at the Command and General Staff College in academic year 1982-83.
tation, well as that of its counterparts at the Army War College, an interest has developed throughout the Army. Officers from the highest echelons as well as from single battalions have now taken up staff riding. Without exception, those commanders who have already used the staff rice confirm its value in developing leaders; in introducing their officers to the benefits of military history; in supplementing current doctrinal, operational, and technical knowledge; and in improving unit morale and cohesion. The U.S. Army Center of Military History has been designated as the coordinator of the Army's staff ride program. This brochure outlines the various requirements associated with staff riding and establishes flexible and practical standards for a successful exercise. The author of this brochure, Dr. William Glenn Robertson, is an associate professor of military history at the Command and General Staff College. He developed and executed the concept of the new staff rice and heads that program for the Combat Studies Institute under the leadership of Director Col. Louis D. F. Frasche. 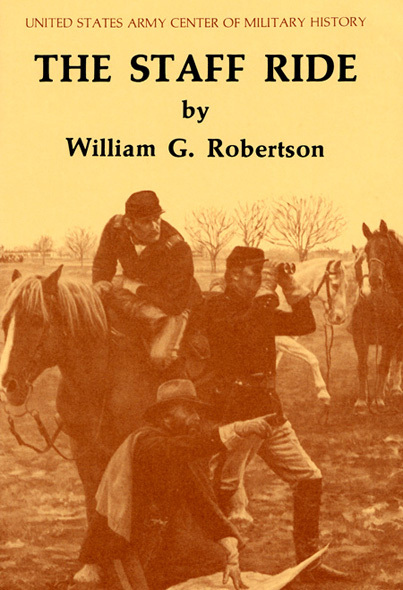 Dr. Robertson is a lifelong student of the Civil War and a veteran of many battlefield studies. His experience in the conduct of the staff ride is distilled in the pages that follow. One final and important note: All those who use this brochure as a guide for their staff rides are encouraged to report their experiences, problems, and successes to the Combat Studies Institute's Staff Ride Team. As new ideas and approaches are reported, this publication will be updated, revised, and periodically reissued. By its very nature, war is a highly complex affair with a virtually infinite number of variables. Conducted in a dynamic environment by human beings, themselves infinitely variable in personality and intellect, war is played out on the three-dimensional chessboard of terrain. That war is also highly emotional makes it especially difficult to replicate through theoretical formulations because the human variables are impossible to isolate and quantify exactly. Yet soldiers who are charged with the conduct of war must continually strive in peacetime to prepare themselves to wage it successfully. Direct personal experience is one guide, but this knowledge usually is limited in scope and is often in short supply. Theory provides one substitute for experience but alone is far from satisfactory. Not nearly so neat and clear-cut as theory, but far more illustrative of the complexity engendered by human factors in war, is military history. Carefully integrated into training, military history can go far to provide the vicarious experience of war needed to further the professional education of soldiers. One of the most effective ways to enlist military history in the cause of professional military education is to study the operations of opposing forces in actual campaigns. Campaigns of any historical period are replete with valuable lessons for the professional soldier. Changes in technology and corresponding changes in doctrine render some of the lessons obsolete, especially those linked to minor tactics. But other lessons are timeless because they spring either front universal operational principles or from universal human characteristics. It is these universal lessons that are most important for officers who aspire to higher command and a true mastery of the art of war. During their careers most officers are exposed to these lessons in some way, often through a sterile list of maxims or principles to be committed to memory but neither fully analyzed nor understood. Such a method is inadequate to the ultimate purpose, that of so fixing in an officer's mind both the principles and their circumstances that they will become second nature in time of crisis. What the student—the professional soldier—must achieve is what German military theorist Karl von Clausewitz in On War defined as critical analysis: determine the facts, establish cause and effect, and analyze the results. In simpler terms, the soldier must find out what happened, establish why and how events occurred as they did, and decide what these cause and effect relationships mean now. It is the immediacy of this last element—the answer to the question, "So what? "—that makes this approach to battle analysis a peculiarly military endeavor. The effect of such analysis is synergistic in fostering not just lessons but a deeper understanding of the realities of war. A significant component of the detailed study of a campaign or battle is an analysis of the terrain over which the action took place and the effect of that terrain upon the campaign or battle. Good maps are essential for such analysis, but the best maps are poor substitutes for firsthand knowledge of the terrain. Thus a visit to the actual sites associated with a campaign, if they are not too changed, is the ultimate step in analysis of the terrain's effects on the action studied. If detailed historical case study encourages the identification of universal military lessons, then a visit to the actual site is the ultimate means of reinforcing these lessons in the minds of students. The combination of systematic historical study of a campaign with a visit to the site of operations for the purpose of professional military education is a staff ride. Armies of various nations have conducted staff rides since at least the mid-nineteenth century. As might be expected from their diverse origins, staff rides have varied widely in concept and execution. In some instances the operational situations employed as teaching vehicles have been hypothetical, in others they have been historical. The goals of staff rides have varied from the specific testing of operational concepts to the general enhancement of professional and analytical skills. All staff rides, however, have one idea in common—to place students on an actual piece of terrain, confront them with an operational situation, and stimulate them to reach conclusions or derive lessons from the experience. 1. A tactical exercise without troops (TEWT) involves a hypothetical scenario played out on actual terrain, usually employing current doctrinal concepts. Although the exercise may take place on an actual battle site, any relationship to historical events is usually coincidental. A tactical exercise without troops uses terrain, but not history, as a teaching vehicle. 2. A historical battlefield tour is a visit to the site of an actual campaign but with little or no preliminary systematic study. If led by an expert, the historical battlefield tour can stimulate thought and encourage student discussion but within limits set by the lack of systematic preparation and involvement. A historical battlefield tour uses both terrain and a historical situation but does not have a preliminary study phase. 3. A staff ride consists of systematic preliminary study of a selected campaign, an extensive visit to the actual sites associated with that campaign and an opportunity to integrate the lessons derived from each. It envisions maximum student involvement before arrival at the site to guarantee thought analysis, and discussion. A staff ride thus links a historical event, systematic preliminary study, and actual terrain to produce battle analysis in three dimensions. It consists of three distinct phases: preliminary study, field study, and integration. A. To expose students to the dynamics of battle, especially those factors which interact to produce victory and defeat. B. To expose students to the "face of battle," the timeless human dimensions of warfare. C. To provide case studies in the application of the principles of war. D. To provide case studies in the operational art. E. To provide case studies in combined arms operations or in the operations of a single arm or branch. F. To provide case studies in the relationship between technology and doctrine. G. To provide case studies in leadership, at any level desired. H. To provide case studies in unit cohesion. I. To provide case studies in how logistical considerations affect operations. J. To show the effects of terrain upon plans and their implementation. L. To encourage officers to study their profession through the use of military history. M. To kindle or reinforce an interest in the heritage of the U.S. Army. In fact, a carefully designed and implemented staff ride can attain simultaneously all of these objectives and more. Depending upon the campaign selected, the staff ride can illuminate any principle or lesson at any chosen level. Because its mixture of classroom and field study facilitates student involvement, it ensures that any educational benefits are more likely to be retained. The commander should view the staff ride as a part of his training program to develop his subordinates. Like the Army Test and Evaluation Program, the staff ride should be exercised, critiqued, and improved upon. Its focus may vary according to the level of command to be exercised, the lessons to be emphasized, or the type of operation to be studied. Whatever form it takes, the staff ride is a continuing professional development exercise which will outlive any commander's tour. Like all major recurring training exercises, the staff ride should pass from project officer to project officer, each of whom becomes expert in its conduct. The staff ride file—all supporting documents, student packets, logistical support data—is part of the unit file and does not leave with a commander or project officer. The primary instructor and his associates should have maximum knowledge of the selected campaign to the degree permitted by circumstances. In other words, staff ride instructors must be true subject-matter experts. They should ultimately be able to identify all important facets of an extremely complex human event and understand how these facets relate to each other. Having mastered their subject, the instructors should impart this knowledge to students by using current military concepts and terminology wherever possible. This subject-matter expertise will seldom be immediately available but will come incrementally with every iteration of the staff ride. Students must have maximum knowledge of and involvement in the staff ride to the degree permitted by circumstances. Students must not be permitted to visit the campaign site without a working knowledge of the basic framework of events, nor should they be passive spectators at any stage in the exercise. Gained through both individual study and collective discussion, this knowledge and involvement will reap large benefits during the field study portion of course. The key is that students are active participants in the educational process in the exchange of information, in the stimulation of thought, and in the collective analysis of the military operation. Staff ride instructors must be aware that the preliminary study and field study phases are individual parts of a larger whole. Standing alone, they cannot drive home the desired lessons with the same force as a truly integrated presentation. Without the field study phase, the preliminary study phase is an incomplete form of battle analysis, taught in a classroom environment. Without the systematic analysis of the preliminary study phase, the field study phase is simply a battlefield tour. Carefully integrated, the two activities generate optimal understanding and analytical thought. licensed guides, and local historians may assist materially, they cannot be expected either to understand the particular educational focus of the exercise or to design a program with the U.S. Army's needs in mind. To the degree that the instructor team not only designs the staff ride but conducts all aspects of it as well, the goals dictated by the particular situation are best achieved and the U.S. Army's needs best served. 1. Be thoroughly conversant with the sources, both primary and secondary, relevant to the campaign selected. 2. Understand the organizational, doctrinal, and technological context in which the campaign took place. 3. Understand the operational context in which the campaign took place. 4. Be thoroughly conversant with the biographical data available on the opposing commanders and their principal subordinates and be able to characterize those individuals succinctly. 5. Know the orders of battle of the opposing forces and be able to characterize significant units in terms of size, armament, and quality. 6. Be thoroughly conversant with the movements and operations of all significant units in the campaign and be able to distinguish those events chronologically. 7. Be able to analyze the campaign and determine, to the degree possible, the factors significant to the historical outcome, including terrain not visited. 8. Know the ground associated with all aspects of the campaign, to be able to guide students easily to all relevant locations. 9. Understand current U.S. Army doctrine and terminology. 10. Be able to interpret the significant events of the campaign in terms of current U.S. Army doctrine and terminology wherever possible and assist students to derive usable lessons from the comparison. 11. Be able to assess carefully and monitor continually students' knowledge and interest levels to generate and retain their involvement throughout the exercise and keep them from becoming passive spectators. 12. Continually work to refine and improve the staff ride by developing new sources, new field study routes, more effective training aids, and great subject-matter expertise. No matter how well trained in peacetime, units behave differently in the first engagements than in subsequent contests. If "first battle" lessons are important, engagements such as First Bull Run or Kasserine Pass should be chosen. Otherwise, operations involving veteran units will provide a far richer variety of lessons. Certain sites are well suited to illuminate lessons at the small-unit level but offer little from the operational perspective of war. Other campaigns are rich in operations that illuminate timeless staff problems. A staff ride class consisting of officers at battalion and company level should select a campaign most used in providing lessons for that particular echelon of command. Similarly, a staff ride class consisting of general officers will profit more from studying a campaign chosen for its operational situations than one chosen for its minor tactics. Many campaigns (Napoleonic, American Civil War, the world wars, and the Korean War, for example) are complex enough to serve as excellent teaching vehicles at any echelon of command. Campaign sites can be found which encompass virtually any type of terra desired—mountains, plains, heavy vegetation, desert, large or small streams. The staff ride methodology can accommodate virtually all significant types of units. Most campaigns provide opportunities for studying the operations of infantry, artillery, and cavalry units, either singly or as combined arms. Similarly, logistical and support functions can usually be addressed in any campaign. Some campaigns, however, are not particularly useful in illuminating the role of specialized units such as engineers. Twentieth-century innovations such as armor and aviation are most easily studied on modern battlefields, although open-minded students guided by imaginative instructors can study these branches by analogy and on premechanized battlefields. Some campaign sites remain relatively unchanged from their original historical settings, either because of conscious preservation or because of unsuitability for development. Other sites have been altered to one degree or another but are still recognizable and thus usable. Still others have been virtually obliterated, leaving little or nothing of the historical scene intact. Staff rides can be conducted at any of these sites, but as the degree of historical integrity declines, the task of the primary instructor and his associates becomes more difficult. Students have enough difficulty in mastering the details of past organizations and events; their task is made all the more difficult if they are required to block out many modern intrusions as well. A staff ride requires the support of as many sources of information as can be obtained. Even the simplest campaign entails an enormous number of facts, and the more of these instructors and students can gather and assimilate, the better they can interpret the campaign. If both primary and secondary accounts exist, both should be utilized. No matter how excellent the chosen campaign may be as a teaching vehicle, it is not a good candidate for a successful staff ride if the instructor-student party cannot be supported logistically. Transportation, messing, and billeting facilities, as needed, must be reasonably close at hand. The student's attention should be completely focused on the intellectual aspects of the exercise and not distracted by inadequate logistical support. Given the fiscal and time constraints imposed by a school's or unit's particular circumstances, the optimum site for a staff ride teaching specific lessons may be beyond the reach of that school or unit. Nevertheless, every effort should be made to seek a site that meets as many of the previous criteria as possible. In a staff ride, the purpose of the preliminary study phase is to prepare student for the visit to the site of the selected campaign. If the student has not been well prepared as to the purpose of the exercise, the organizational and operational setting of the campaign, and the significant events of the action, and if the student has not become intellectually involved in the process of study, then the exercise becomes more a historical battlefield tour. The preliminary study phase is critical to the success of the field study phase and therefore equally critical to the success of the staff ride as a whole. Since staff ride participants will usually be busy U.S. Army professionals who may have had little interest in history, the primary instructor and associates must take student knowledge and interest levels into account when designing the preliminary study phase. The object is not to produce professional scholars but to use historical case study to enhance the professional military education of U.S. Army officers. The preliminary study phase may take various forms, depending upon time available for study and the needs of the participants: formal classroom instruction, individual study, or a combination. Circumstances will dictate which form must be adopted, but it should be clearly recognized that some forms represent far more effective teaching techniques than others. 1. A preliminary study phase consisting solely of a lecture or lectures by the instructor team should be adopted only when extreme circumstances preclude the use of other methods. Lectures, providing little or no opportunity for student involvement, are most likely to produce passive students. In this form, almost all student-instructor and student-student interaction will take place in the field study phase. to study individually before the field study phase of the staff ride. While requiring greater participation by the student than does the pure lecture, this form also forgoes the benefits derived from instructor guidance and group discussion and tends to encourage student passivity. 3. The optimum preliminary study phase combines lecture, individual study, and group discussion moderated by the instructor team. To get students actively involved, instructors may assign them specific subjects to investigate more intensively than the general background material and then brief to the group, either in a formal classroom setting or during the field study phase. Useful subjects in this regard are specific leaders, specific units, critical events, or specific functional areas such as logistics or communications. By creating mini-experts on particular subtopics, this method virtually guarantees lively discussion and divergent viewpoints among participants. Once created in the preliminary study phase, this involvement carries over into the field study phase with decidedly positive results. 4. Few Army organizations will be able to devote to staff rides the time that is available at the highest levels of the Army educational system. This does not mean that staff rides are beyond their reach or that the preliminary study phase should be abandoned. Instead, innovative approaches to the preliminary study phase should be adopted. If formal classroom time is severely limited, it should simply address the purpose and objectives of the exercise as well as the historical, technological, and doctrinal context of the chosen campaign. Carefully selected reading packets geared to individual study then can illuminate critical aspects of the campaign in more detail. If the packets are designed to offer divergent viewpoints and generate discussion, so much the better. This discussion can take place on the battlefield itself. 5. No matter what form is adopted for the preliminary study phase, the instructor team must make every effort to ensure that the purposes of that phase are met. The more limited the time available for group discussion, the more the instructor team must compensate by carefully choosing sources, providing individual study packets, and being available to answer questions and stimulate thought. a. Students must be informed of, and clearly understand, the purpose of the exercise. b. Students must become actively involved in the exercise. They must not lapse into passive spectators. (1) Organization, strength, armament, and doctrine of the opposing forces. (2) Biographical and personality data on significant leaders. (4) Relevant terrain and climatic considerations. (5) General outline and chronology of significant events. d. Students must develop an intellectual perception of the campaign that will be either reinforced or modified during the field study phase. 2. If possible, students should use the preliminary study phase to advance beyond general knowledge in their analysis and understanding. One way to this advancement is to have individual students focus their additional study on particular leaders, units, functional areas, or phases of the campaign. 3. During the preliminary study phase, students must be given access to the best sources that can be provided for them. As a minimum, a modern account (analytical, if possible) and a modern topographical map of the selected campaign should be made available to all participants. Beyond these general materials, relevant primary sources (such as after-action reports, official messages, personal accounts, contemporary maps) should be provided. of those events, and to derive relevant lessons for professional development. Because field study builds so heavily upon preliminary study, each phase must be designed to produce a coherent, integrated learning experience. If the preliminary phase has been systematic and thorough, the field phase reinforces ideas already generated. This is not to say that a systematic and thorough preliminary study phase permits a vestigial or hurried field study phase. Instead, the visual images and spatial relationships created by carefully designed field study reinforce any analytical conclusions acquired earlier. If, on the other hand, preliminary study has been hurried or incomplete, field study may raise entirely new issues or lines of analysis. In either case, the field study phase is the most effective way to stimulate the student's intellectual involvement and to ensure that he or she retains any analytical conclusions reached at any point in the staff ride process. 1. The field study phase should be designed to visit all significant sites associated either with the selected campaign or with the portion emphasized in preliminary study. If only a portion of the field can be visited, the instructor team must summarize what occurred elsewhere so that students comprehend the campaign as a whole. 2. The route should be designed to visit sites in chronological order to avoid confusion and unnecessary complexity. 3. The route should avoid both backtracking and long barren segments to maintain involvement. 5. The route schedule should be flexible enough to permit brief unplanned stops to address issues that students raise spontaneously. 6. If students have investigated certain topics beyond the level of general background knowledge, both planned and spontaneous stops provide opportunities for them to share their findings and stimulate discussion. 7. If available primary sources, such as vivid personal accounts or period photographs, can be linked to specific sites, those sites should be included the route. 8. As much of the route as possible should be traversed on foot. Many terrain features which seem insignificant or are even invisible from a motor vehicle suddenly become prominent when viewed from the foot soldier's perspective. This perspective is critical to understanding all premechanized campaign and most modern ones as well. Widely scattered sites will require motor transport between them, but, even so, students should dismount as frequently possible to experience the effects of terrain firsthand. 9. Ease of access should be considered during the design of the field study route but should not necessarily override other considerations such as chronological development, site significance, or visual impact. 10. If significant sites lie on private land, easements granting temporary access must be obtained from property owners. No entry should be attempted otherwise. 11. If possible, alternate routes should be devised for segments of primary route in case unforeseen circumstances or time constraints require modification of the original program. 12. The instructor team should traverse the primary route and all alternate segments to discover any timing or other problems that might interfere with the successful completion of the field study phase. Instructors should make additional spot checks just before the exercise to ensure that weather, accidents, or road repairs have not made the chosen route impassable. 1. Throughout the field study phase, the instructor team should make every effort to maintain intense student involvement by removing distractions and keeping attention focused on the exercise. historical situation. A partial solution is to have all students carry compasses, maps, and notes on relevant documentary material such as orders of battle. Nevertheless, only the instructor team, with its greater knowledge of both the historical events and the terrain, can ensure proper student orientation throughout the field study phase. a. The reading of vignettes drawn from primary sources. Ideally, such vignettes are brief and colorful. The instructor team should select them beforehand and arrange for easy access in the field. Carefully devised and correctly executed, vignettes will contribute significantly to re-creating the sense of time, place, and mood which every staff ride must achieve to be truly successful. b. The use of veterans. For relatively recent campaigns, veterans of the operation who can supply truly living vignettes are unmatched for encouraging and retaining interest and involvement by participating in discussions with students and instructors. Veterans must be used carefully for best effect; if possible, they should be chosen because of particular roles they played in the selected campaign. Further, the instructor team should screen veterans for articulateness and accurate recollection. In some cases, screening may expose personal biases or personality traits that would make a veteran ineffective. If such difficulties can be overcome, a staff ride which includes veterans of the selected campaign will be extremely rewarding. 4. At every opportunity during the field study phase, the instructor team should stimulate student discussion and relate it to similar discussions held during preliminary study. 5. Any bus used on the field study route should be equipped with a public address system by which the instruction team provides commentary, previews stops, or reads vignettes to break the tedium. situation maps, sketch maps, diagrams, and tape recordings of weapons sounds and period music. 7. The size of the student party and the instructor-to-student ratio will help determine the quality of the field study phase. In general, as the instructor-to-student ratio declines, so does student involvement and discussion. In most cases, thirty-five to forty students are the most a single instructor can lead and retain any degree of personal interchange. A much more effective ratio is one instructor for every fifteen to twenty students. Members of the instructor team should spaced throughout a large party to answer questions, focus interest, and stimulate discussion. 8. During the dismounted portion of the field study phase, the instructor team should maintain a steady pace, neither rushing nor dawdling but progress) purposefully from point to point. The column should be kept compact, with file-closers if necessary, to prevent straggling. Left to their own devices, relatively large groups moving in column tend to disperse and have to be gathered at each stop. 9. Given the inflexibility of travel dates for most staff rides, both instructors and students should be prepared for bad weather. All members of the group should have seasonal protective clothing, and the instructor team should have route modifications and other contingency plans. Normally, these simple precautions will allow a successful field study even if weather is less than ideal. No matter how detailed the preliminary study or how carefully crafted the field study, a truly successful staff ride requires a third and final phase. This integration phase is a formal or informal opportunity for students and instructs to reflect jointly upon their experience. instructor team may use the integration phase to solicit student comments on its performance and suggestions for improvement. The integration phase may be conducted on the battlefield immediately following the field study phase, at a nearby location following the field study phase, or upon the return of the students to their home station. In general, however, the integration phase is most successful when it follows field study as closely as circumstances permit. An instructor should moderate discussion during the integration phase and focus on the exercise just completed. He or she should allot enough time for all who wish to speak and for a complete discussion of any issues raised. The instructor should encourage candor among all participants. A. Both primary and secondary sources are useful in a staff ride. 1. Primary sources are documents produced by participants or eyewitnesses, either contemporaneous with the events described or at some point thereafter. Included among primary sources are official documents such as after-action reports, orders, messages, strength reports, telephone logs, unit journals, maps, and map overlays. Also included are personal accounts such as letters, diaries, and reminiscences. For the most recent conflicts, the oral recollections of a participant are a primary source. Although they, like all sources, must be analyzed critically, primary sources are the raw material from which historical events are reconstructed. 2. Secondary sources are accounts of events produced by nonparticipants who received their information secondhand from primary sources or other secondary accounts. Secondary sources are most often narrative in form; many are analytical in nature. Their authors range from enthusiastic amateurs to professional historians. (Washington: Government Printing Office, 1880-1901); a secondary source is Bruce Catton's A Stillness at Appomattox (Garden City, N.Y.: Doubleday, 1953). b. For the period of World War II, a primary source is a unit journal held in the National Archives; a secondary source is any volume in the official series United States Army in World War II, published by the U.S. Army Center of Military History. 4. The function and placement of primary and secondary sources in the course structure differ significantly. B. Secondary sources are most valuable in the initial stages of study when the immediate need is for general background information and a simple chronological outline of events. Secondary sources can also bring order to what initially seems a confusing jumble of facts and conflicting testimony. Secondary sources thus represent both an introduction to the subject and a convenient framework on which to attach relevant primary materials as they are digested. Analytical secondary sources may also stimulate student analysis by providing a frame of reference for initial discussion. C. Valuable as they are, secondary sources should not be the sole materials furnished to staff ride students. Because they represent a highly selective winnowing of a much larger mass of primary materials, secondary sources tend to omit many details that may be critical to an analysis of events by professional soldiers. Also, by selecting only certain facts for presentation, the author of a secondary source tends to focus the student's attention in particular directions at the expense of others, thereby losing profitable avenues of inquiry to all but the most diligent. Finally, no matter how colorfully written, secondary sources lack the immediacy and the impact of an account by a participant or an eyewitness. are part of much larger information and book-lending networks. The objective should be to assemble the best available operational picture of the action and arrange it to give the students a thorough foundation for the preliminary study phase. As a further inducement to participate in both the preliminary study and field study phases, students might well be required to prepare their own operational schematics and maps, especially if the secondary sources fail to provide the kinds of details needed for the purpose of the exercise. All such measures, however, are compromises. Efforts made by units even in the most adverse circumstances to go beyond secondary sources will be rewarded by a more stimulating and professionally useful experience. 1. Primary sources provide a large quantity of raw material for student analysis. Their richness of detail gives students the opportunity to understand exactly how the opposing forces conducted their operational and administrative affairs and permits comparison between earlier and current practice. Reading original orders and message traffic instead of summaries and paraphrases allows students to draw their own conclusions about commanders' and staffs' mindsets at particular times. Similarly, student analysis of original after-action reports may generate insight into how the authors perceived certain events and why they emphasized or omitted those events. Examination of contemporary maps with all their imperfections may clarify otherwise inexplicable operational decisions. 2. Primary sources allow students to relate more closely to a past situation. By the very nature of the exercise, staff ride students must attempt to place themselves figuratively in another time and context. This sense of "how things were" is difficult to attain but, to the degree it can be achieved, contributes signally to the success of the exercise. Primary sources, judiciously used in both the preliminary study phase and the field study phase, are the most important resource available to propel the student to an earlier time. primary sources strengthens his or her commitment to the exercise and involvement in a learning experience. An added training benefit accrues to military leaders who use these contemporaneous records; the staff estimates, orders, overlays, and after-action reports are the same, or similar, kinds of staff actions they encounter day to day with the U.S. Army in the field. F. The use of primary sources is not without pitfalls. For instance, primary does not always equate to correct. Because staff ride students are professional soldiers rather than professional scholars, they often need assistance in thread their way through the primary materials provided for their use. As their own knowledge increases over time, instructors should be able to provide this guidance. While important, such assistance should in no way relieve students of their responsibility to involve themselves deeply in the analytical process. Used intelligently, primary sources contribute greatly to the success of a staff ride; used ignorantly, they contribute equally to its failure. Each student should have access to topographical maps of appropriate scale, as well as copies of maps contemporary to the historical period under study. Maps of either type in 35-mm. slide, viewgraph, or panel chart format may be used by both instructors and students in the preliminary study phase. During the field study phase the instructor team may use appropriately marked ma to illuminate specific points, while students may use maps to orient themselves. is to match a historical photograph to its actual site for a then-and-now comparison. When photographs are not available, these illustrations may serve the same educational purpose. Diagrams created especially for the staff ride by the instructor team may be used to good effect in both the preliminary study phase and the field study phase. Although these items may be costly and may not fit into the time constraints of the preliminary study phase, they should not be overlooked as an educational resource. Film footage of twentieth-century conflicts is especially powerful. Other film or television tape series showing the employment of weapons of an earlier era can provide a visual dimension to battle analysis not attainable by any other means. In some circumstances tape recordings may be useful either in illustrating a point or in setting a mood. Recordings of nineteenth-century weapons firing may help to re-create nineteenth-century campaigns. Recorded music from any period may provide a useful link to the past. Veterans may record their recollections if they are unable to join the field study phase in person. Uniforms, personal effects, weapons, and inert ammunition may be used in the preliminary study phase to illustrate a wide variety of points. Their utility increases if students can examine them directly. Although often difficult to research accurately, terrain boards may have some utility during the preliminary study phase to illustrate the general nature of the terrain on which the selected campaign was conducted. In no sense, however, should they be considered a substitute for the field study phase of a staff ride. Depending upon such variables as the site selected for study, the size of the group, and the amount of time available, logistical support of the field study phase of a staff ride can be a complex operation that requires considerable prior planning and coordination. Although often unnoticed by participants, particularly if competently executed, this logistical support is a major factor in the success or failure of the exercise. Specific details will vary with individual staff rides, but certain general principles remain valid. The logistical support of the field study phase should be so designed that transportation, messing, and billeting will not detract from the educational aspects of the exercise. This does not mean that the instructor team must cater to every whim of the participants. It does recognize, however, that poorly designed travel schedules, inadequate messing arrangements, and uncomfortable billeting may distract students from their primary purpose. Logistical support is an integral part of field study and must be taken into account during the design of that phase. For example, travel schedules may define the amount of time available at the site and thereby limit what can be done educationally. Messing sites may be limited to certain locations by regulation or availability and therefore require adjustment of the proposed field study route. Parking for motor vehicles or landing zones for helicopters may be similarly limited and require adjustments. Safety considerations may also force deviation from preferred educational routes. These and other logistical considerations must be identified early in the planning process and integrated into the design of the field study phase. If identified soon enough, potential educational-logistical conflicts can usually be resolved satisfactorily. Because of the detail and coordination involved, responsibility for logistical support of the field study phase should be formally assigned to a member of the instructor team at the earliest possible moment. This logistical coordinator should consult regularly with the primary instructor to integrate education and logistics. When the student party is especially large, additional members of the instructor team will need to assist the logistical coordinator. Those assigned to logistical duties must be made aware of the importance of their work to the success of the exercise and should take pride in their tasks. Those items arranged by the logistical coordinator and his assistants—timely and dependable transportation, timely and nourishing meals or refreshments, cost-effective but comfortable billets—all contribute to the quality of the staff ride. be devised. Standard precautions should include first aid kits, evacuation plans, and identification of nearby sources of medical assistance. Although professional military education is sufficient reason for devoting time and resources to a staff ride, certain secondary benefits may accrue as well. These benefits spring from the fact that, for many participants, a visit to a great battlefield is an emotional experience that may reinforce their feelings for their profession, their units, and one another. If participants belong to the same unit, their shared experiences during the exercise may strengthen the camaraderie and esprit so necessary for unit cohesion. If promotions or individual achievement awards are due to be conferred at the time of the staff ride, there can be no better setting for the ceremony than a site hallowed by earlier deeds of sacrifice and valor. Significant in themselves, such experiences become even more meaningful in the context of a staff ride to the site of a great campaign of the past. An example of an exercise designed principally to achieve these secondary ends is described by Lt. Col. Richard M. Swain in "Terrain Walk" (Field Artillery Journal 52 [July-August 1984]:46-47). The design and conduct of a staff ride is not a simple task to be taken lightly or done on the cheap. By its very nature, a staff ride is both time and resource intensive. A staff ride requires subject-matter expertise, intelligently applied in a systematic way, to guide professional soldiers through the most complex of intellectual exercises—the analysis of battle in all its dimensions. If a terrain exercise is all that is required, a TEWT can be constructed on any convenient piece of ground. Such terrain exercises are useful, but they are not staff rides. If soldiers are to be taken to a battlefield of the past but there is little or no time for systematic preliminary study, a historical battlefield tour is all that is required. Such tours also have their place, but they are not staff rides. A staff ride yields far broader results than a TEWT or a tour but is far more difficult to devise. Those who want to create a staff ride must be aware of these difficulties. Carefully designed and intelligently executed, a staff ride is one of the most powerful instruments available for the professional development of U.S. Army leaders. Situation: 19 September 1863, p.m. Confederate units have shattered Brig. 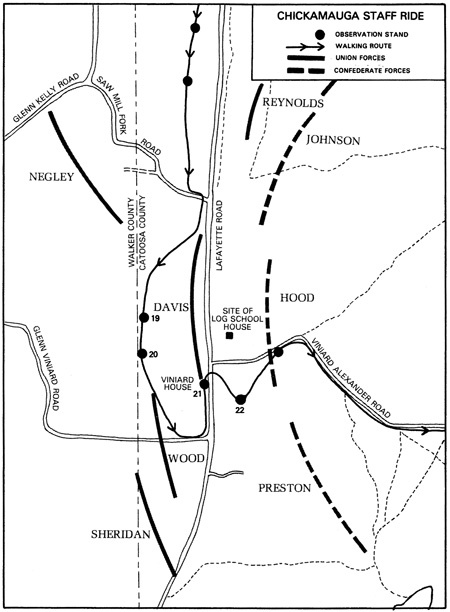 Gen. Jefferson Davis' division and driven it west and out of the Viniard field. Survivors pass through a new line established by Col. John T. Wilder's brigade. Armed with seven-shot Spencer repeating rifles, Wilder's men halt the Confederate charge. The Confederates take refuge in a nearby ditch or ravine. Capt. Eli Lilly moves part of his battery forward to sweep the ravine with devastating effect. Vignette: Colonel Wilder's recollections: "At this point it actually seemed a pity to kill men so. They fell in heaps, and I had it in my heart to order the firing to cease, to end the awful sight." From John Rowell, Yankee Artillerymen: Through the Civil War with Eli Lilly's Indiana Battery (Knoxville: University of Tennessee Press, 1975). Situation: Same as Stand 19, but in the infantry line, one hundred yards south. From Theodore Petzoldt, My War Story (Portland, Ore., 1917), pp. 103-04. Situation: Same as Stand 19, but before Davis' division has broken. One of the brigade commanders, Col. Hans Heg, is mortally wounded while heroically rallying his troops. Carried westward across the Lafayette road, he dies just north of the Viniard house. Situation: 19 September 1863, evening. At the end of this day, both sides break contact and withdraw from the Viniard field, leaving hundreds of wounded and dead behind. The cries of the wounded greatly affect those who hear them. Teaching points: analysis of terrain, the "face of battle"
From Petzold, My War Story, pp. 106-08.